• Create and maintain international and national strategic links. • Provide modern common-use economic infrastructure to further growth and economic diversity. 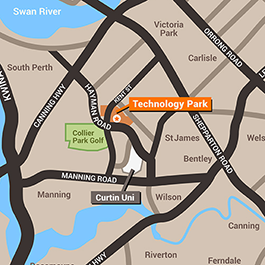 TPWA is located just 6 kilometres from the central business district of Perth and was established as the first such facility in Australia in 1985. Designated land was declared and gazetted according to legislation in 1986. Adjoining land currently occupied by the Department of Agriculture and Food in the locality of Kensington was also gazetted as Technology Park in 2007. This extended the TPWA area established and managed by the Minister under section 6(e) of the Industry and Technology Development Act 1998. Developments within TPWA and associated land of some 60 hectares are controlled by the special use zoning for research and development within the Kensington locality by the City of South Perth, and within the Bentley locality by the Town of Victoria Park.